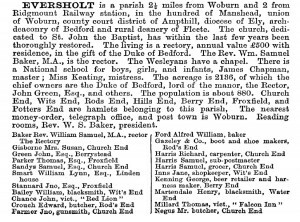 EVERSHOLT is a parish 2½ miles from Woburn and 2 from Ridgmount Railway station, in the hundred of Manshead, union of Woburn, county court district of Ampthill, diocese of Ely, arch­deaconry of Bedford and rural deanery of Fleete. The church, dedicated to St. John the Baptist, has within the last few years been thoroughly restored. The living is a rectory, annual value £500 with residence, in the gift of the Duke of Bedford. The Rev. Wm. Samuel Baker, M.A., is the rector. The Wesleyans have a chapel. There is a National school for boys, girls, and infants, James Chapman, master ; Miss Keating, mistress. The acreage is 2136, of which the chief owners are the Duke of Bedford, lord of the manor, the Rector, John Green, Esq., and others. The population is about 880. 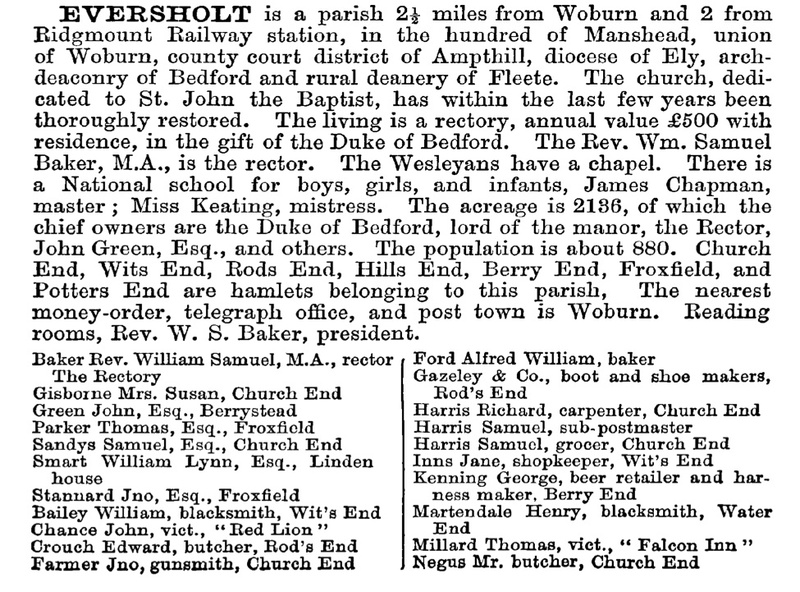 Church End, Wits End, Rods End, Hills End, Berry End, Froxfield, and Potters End are hamlets belonging to this parish, The nearest money-order, telegraph office, and post town is Woburn. Reading rooms, Rev. W. S. Baker, president.